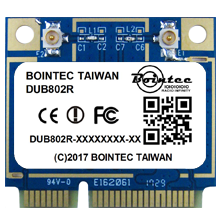 Bointec DUB802R is a solder down module of Wi-Fi 802.11bgn with Bluetooth 2.1/3.0/4.0 multi-function network interface controller by USB 2.0.It combines a wireless LAN MAC, a 1T1R capable baseband, and RF. Using by Realtek RTL8723BU, it provides a complete solution for a high-performance integrated wireless and Bluetooth device. The integration provides better coordination between 802.11 and Bluetooth, and with sophisticated dynamic power control and packet traffic arbitration, it is able to provide the best coexistence performance overview. Target range of applying DUB802R are :MID, networking camera, STB, GPS, Desk-Top Pc ;Note-book ;TV; Blue-ray Disk; Set-top box, Hard disk player, Network Radios, PSP and other device which need be supported by wireless networking.